I was born and raised in Cerritos California just like both of my parents. I was brought up by a hard-working single mom, who always pushed me toward higher education. Even though I was basically raised as an only child, I have an older step-brother that I look up too. Three out of my four years in high school I was on the cheerleading team and also on student council. During college I held an internship at a non-profit organization, which focused on providing health education to underserved communities, which fueled my passion for helping others. 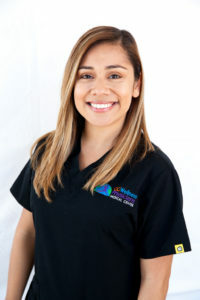 Before working for OC Wellness Physicians I worked for Nordstrom full time while pursuing my Bachelors’ Degree in Community Health at Cal State Dominguez. My favorite childhood memory includes going to Portland, Oregon during the summer and staying at my aunt’s beautiful farm with my two older cousins. During my free time I love to spend time with my family and my great group of girlfriends. I enjoy the outdoors, I love going the lake, dirt bike riding and camping with friends and family. I like to live a healthy lifestyle, by exercising and eating vegetables from our garden.